The 272nd Soundtrack of the Week is Jo Hisaishi's music for Hayao Miyazaki's Kiki's Delivery Service. 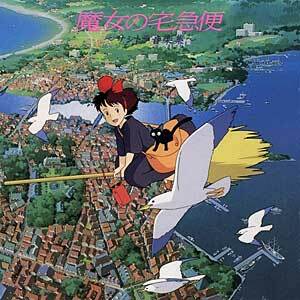 This is one of my favorite movies of all time and tied with My Neighbor Totoro for being my favorite Miyazaki film. Hisaishi combines music of beauty, sadness, hope and love so brilliantly here; in combination with Studio Ghibli's gorgeous hand-drawn animation, the effect is overwhelming. Kiki's main theme is heart-stirring and tender, first heard as a waltz but recurring in a number of different variations. The instrumentation is especially creative and ingenious, perfectly mirroring the film's mash-up of several different European areas. Miyazaki has created his own world and Hisaishi has given it just the right musical identity. Try to watch the Japanese-language version of this movie. The English-dub isn't terrible but there are some radical changes. The biggest of these involves Kiki's cat, Jiji. I love Phil Hartman but casting him as Jiji's voice essentially rewrites the whole character. Another change which had less impact on the movie involved the song Kiki listens to on her transistor radio as she leaves home in the beginning of the movie. The song in the English version isn't bad but the Japanese had a mid-century rock/doo-wop style which was a much better fit with the world of the film. In fact, it's the reason I bought the CD!